To find the rate of flow, you need to differentiate the function. This is substituting in for gives the answser of . If water is poured inside a cylindrical cup with radius of 3 inches at a rate of 2 inches per second, how fast is the surface rising? Write the volume of the cylinder. Differentiate the volume with respect to time. The height is increasing at a rate of inches per second. Suppose a fish tank has a shape of a square prism with a length of 10 inches. If a hose filled the tank at 3 cubic inches per second, how fast is the water's surface rising? Given the length of the cube is 10 inches, the length and the width is also 10 inches. However, the height of the water is unknown. Let's assume this height is . Write the volume of the water in terms of . Differentiate the volume equation with respect to time. Substitute the rate of the water flow into . The water is rising at a rate of inches per second. Make sure you identify what this question is asking. A large vat contains of butter. The vat has a small leak, out of which, of butter escapes every hour. What is the rate of change in the volume of butter in the vat? This question tells you that there is a leak of mL/hour, and then asks you to identify how quickly the leak is causing butter to be lost. The key is to identify the units, mL/hour, see that there are mL/hour being moved, and recognize that the units are negative, as mL are being removed every hour. Thus the rate of change in the volume of the butter is . 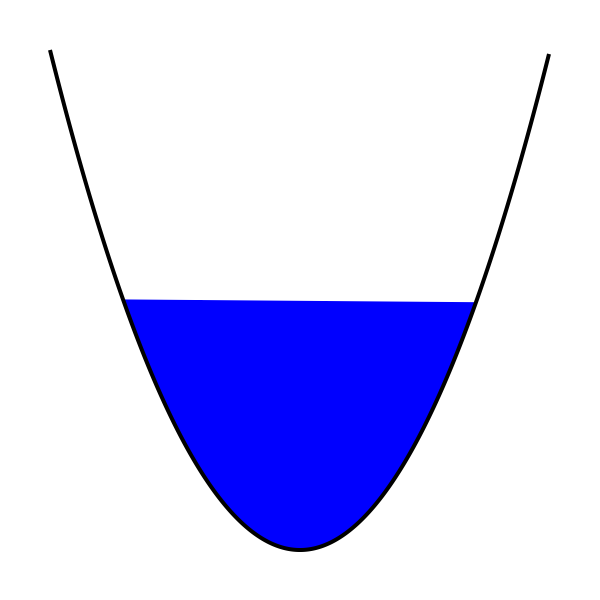 A cylindrical tank with a radius of 20 centimeters and an arbitrary height is filling with water at a rate of 1.5 liters per second. What is the rate of change of the water level (its height)? Where r represents the radius and h the height. The volume of water (in liters) in a pool at time (in minutes) is defined by the equation If Paul were to siphon water from the pool using an industrial-strength hose, what would be the rate of flow at in liters per minute? We can determine the rate of flow by taking the first derivative of the volume equation for the time provided. The volume of water (in liters) in a river at time (in minutes) is defined by the equation . What is the river’s rate of flow at in liters per minute? The volume of water (in liters) in a tank at time (in minutes) is defined by the equation . What is the tank’s rate of flow at in liters per minute? The area bouned by the curve and is being filled up with water at a rate of unit-squared per second. When the water-level is at how quickly is the water-level rising? Therefore, the height will be rising at units per second. The volume of water (in liters) in a stream at time (in minutes) is defined by the equation . What is the stream’s rate of flow at in liters per minute?